The daughter of chart-topping pop star Holla Jones, stylish and sensitive Hudson Jones is on the brink of her own musical debut. Hudson has inherited her mother's talent, but she hasn't yet embraced Holla's love of the megawatt spotlight. Can Hudson find a way to perform that reflects her own low-key style? Or will Holla see to it that her only daughter becomes a pop music sensation? 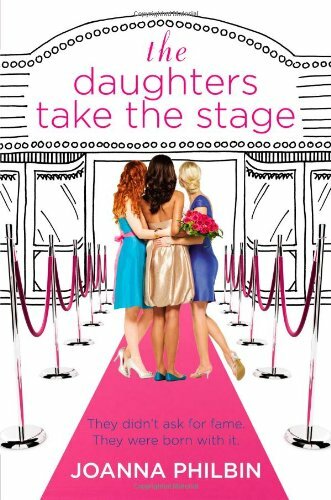 Go behind the music in this third novel in Joanna Philbin's stylish and heartfelt Daughters series. Now that Jen Calonita has finished her Secrets of My Hollywood Life series, I need a cute, fluffy series to replace it. Joanna Philbin's The Daughters series fits the bill perfectly. Nice characters, strong friendships, some romance, and uplifting messages. Fame, fashion, and wealth. Just what I want in my light, contemporary reading material. The third Daughters books focuses on the final character in the trio: Hudson. Hudson is the daughter of pop superstar Holla Jones. I'm imagining that she's somewhat like Madonna in personality and style, either intentionally or unintentionally. Holla is a notoriously difficult person to work or live with. She needs to constantly control everything. Nothing is more important than controlling her only child, Hudson. Unlike her mother, Hudson is a kind, gentle character who lives to please. She disagrees with her mother often, but would rather go along with her to keep the peace. Unfortunately, Holla's ideas have taken Hudson in a direction that she doesn't want to go. Hudson wants to be a jazz/soul singer who plays in intimate clubs. Holla has instead planned out a huge pop star future for her daughter (think Willow Smith). Hudson doesn't know how to say no. After focusing on a more prickly, spoiled (although still nice) character in the second Daughters book, it is a welcome change to have Hudson as the main character. She is just as privileged as Lizzie and Carina, but her low self-esteem makes her seem down-to-earth and relateable. While she can't say no to people, her inherent kindness also makes it easier for her to give people chances. This enables her to make friends in places she wouldn't expect. It's pleasant inhabiting Hudson's mind even when you want her to grow a backbone. As you would expect, this book is all about self-growth. Hudson learns to stick up for herself and live her own dreams. I don't think it's a spoiler for me to say this. These books are predictable, but you don't read them for a surprising plot arc. Rather, read The Daughters series for the pleasant journey towards an expected ending. The characters are such nice people - girls I would want to be friends with in real life. There's some romance in the books (although less in this one than the others), but the primary focus is on friendship. The Daughters is a fabulous series. Perfect for younger YA readers but still interesting enough that older YA readers will enjoy it. I've never heard of this series Alison, but I'm always on the lookout for some cute, fun, light books that I can intersperse with some of my darker paranormal reads:) I'll be checking out the first two books! This sounds like such a cute series for fun, quick reading. I need to look for the first book! Another new to me series. Where do they all come from? This sounds a lot Mind Candy. Sure these might be a bit predictable, but they're still feel good stories that everyone can relate to in some way. That's always nice. This one is new to me, and I really want to read it. Sometimes I need that light, entertaining read and this sounds like it is perfect. Great review! This is another great series that I need to start. I am so curious about it. Thanks for the review! this looks so cute!! thanks for the review! These are such fun books! They definitely fit right in that Secrets of my Hollywood Life slot. I haven't heard of this one. It sounds cute. Sounds cute! Even if a plot is a bit predictable, sometimes it's the character journey that makes the book so remarkable. I LOVE a good series - The Betsy-Tacey series sounds wonderful! From ages 5 to marriage, that sounds like quite a long series, I'll definitely have to check it out. I love when we're allowed the time to get to know characters and see them develop and change.